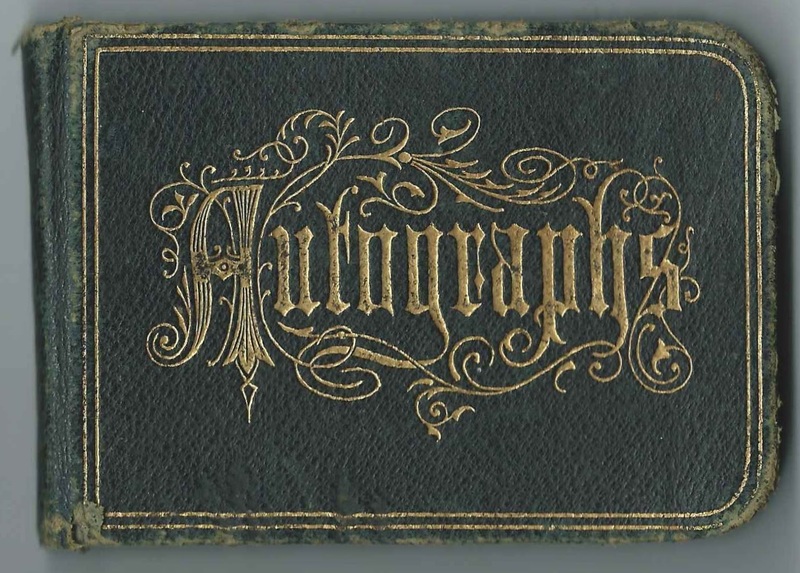 Autograph album with inscriptions from 1877 to 1891 of people mostly from Brownfield, Maine; it contains ten calling cards, one business card and 3 book plates. The owner isn't identified, though two inscribers, A. C. Morrison and his wife Mary L. Morrison of Brownfield, Maine, described themselves as the owner's step parents. The only inscriptions beyond 1879 were inscribed in 1881 by L. A. Cole and in 1891 by Wessie Cole, who were, I believe, Llewellyn A. Cole and his son Eugene Weston Cole. I'm wondering if the owner might have been related to Llewellyn. The album measures approximately 4" by 2-3/4" and contains 29 inscriptions and 11 calling cards, as well as the notice, shown below, of the death from scarlet fever of Frankie C. Dresser, son of Clayton D. and Miranda F. Dresser, at the age of 2 years and 8 months. An alphabetical list of the inscribers appears at the end of this post. Mr. L. A. Cole of Boston, Massachusetts, inscribed in September of 1881. 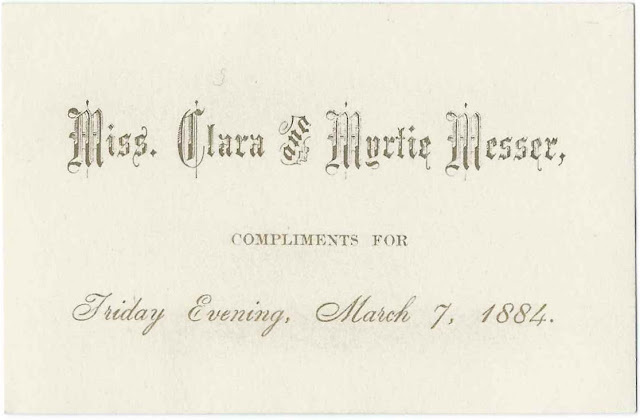 One of the only inscriptions made after the 1870s. Presumably Llewellyn A. Cole of Brownfield, Maine. Wessie Cole of Brownfield, Maine; inscribed on both facing pages, with the page on the right bearing the date of December 25, 1891. Presumably Eugene Weston Cole, whose father Llewellyn A. Cole was likely the inscriber L. A. Cole. C. D. Dresser of Bridgton, Maine; inscribed on January 29, 1877. Clayton D. Dresser, husband of inscriber Marianda or Miranda F. (Smith) Dresser and father of Frankie C. Dresser. Death notice pasted on the inside back cover: Bridgton - April 24th, of scarlet fever, Frankie C., only son of Clayton D. and Miranda F. Dresser, aged 2 years, 8 months. 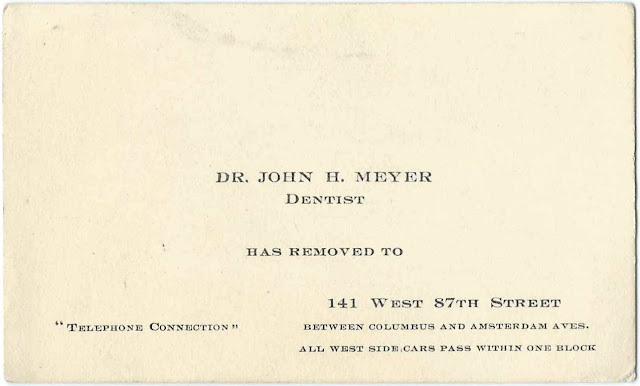 Dr. John H. Meyer, Dentist, 141 West 87th Street, between Columbus and Amsterdam Aves. "All West Side Cars Pass Within One Block"
Calling card of Mr. Willis Sargent, dated March 19, 1884. Middle initial might be D or ?